So, you understand value investing is a great strategy to find profitable stocks, but you do not have the time to do the research? You're not alone. 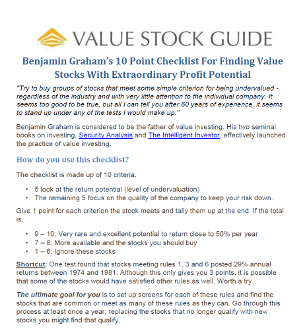 That's why I've assembled this free checklist to help you find profitable value stocks easily. Discover the 10 simple checks Ben Graham himself determined are key to profits. No more second guessing if you are looking at the right things! Fully annotated by me with links where you can easily get data from. No need to hunt around on the internet! A system that has outperformed the market in 4 out of 4 decades tested! Yes, Send Me the Checklist Right Away!